Minute Maid field, park, stadium--whatever--has always been a joke of a stadium and I have always hated to see games played there. Although I feel the Cards won there more often then not (I could be completely wrong, but I can't be bothered to look atm) it was more of an annoying obstacle course. Crawford boxes jutting out. Poles and hills butting in. The dangerous right field line (yes, I know it's not too dissimilar from Busch III). Praise the Lord the Astros are moving in 2013! Although I'll miss the rivalry with the Astros it's about the same as I'd miss the Pirates leaving. I think balancing out the leagues is good for baseball. I makes sense. It didn't make sense to change things before. That said, I'm not sure I like the other change--or why it was even required. I'm not sure I even understand the logic. We still have two leagues with three divisions each, yes? So, why do we need another wild card. Before us stands the debate: the excitement of playoffs with wild cards (what kind of hypocrite would I be if I denied us this last season and post-season?) vs. the reward for winning the league in the marathon. Another wild card DOES water things down--you can't deny that. But you can't deny the excitement that more teams provide. Would you have wanted to watch the Phillies play the Yankees? Maybe, but more are included--and that sells. Currently I believe that it's watered down enough--it's not a stodgy Murphy's Irish Stout, but lets not turn it into Keystone Light please! There are worries that the symmetry will lead to other changes that will make the leagues more similar--like the elimination of the DH--something that I am DRAMATICALLY opposed to. The fear is that with more interleague play (a feature that comes with equal 15 team leagues) will come more use of the American League pitcher with a bat in his hand--an image that conjures up images of Bugs Bunny striking out the side with one pitch as the Gas House Gorillas flail at the ball. Such a fear may indeed lean toward the universal use of a DH. The import of such a decision is well chronicled and I wholly am opposed to such a flat and droll game. We'll call it the "checker effect"--the reason more people play checkers than chess is simplicity and not because checkers is a superior game. "Let the fools have their tar-tar sauce," he seemed to say. Such a change would be worse (by far) then the NFL's decision to change the placement of the kickoff--which has grossly dumbed down the game as well. 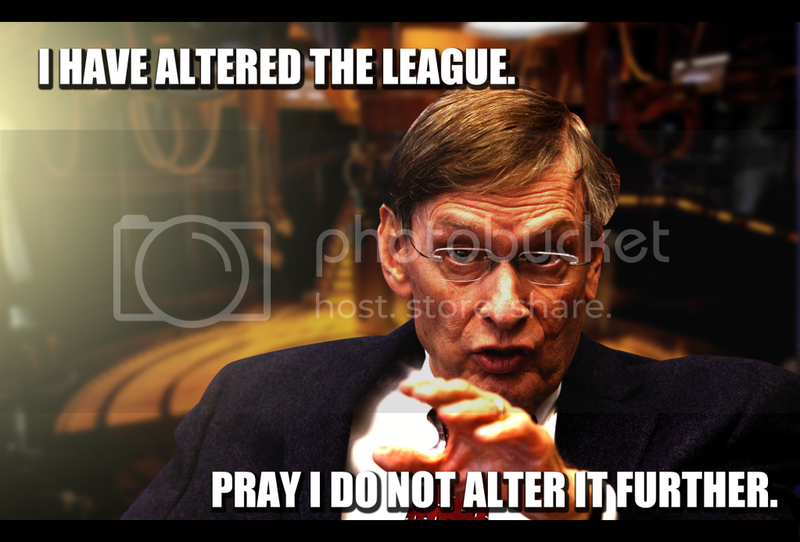 "This deal is getting worse all the time" and I fear what changes Selig will make next. The Angels said they won't aggressively pursue Fielder or Pujols. It's going to take an aggressive bid to take Pujols from St. Louis and I believe that the Angels were the biggest threat. In different news the Marlins gave Pujols a substantial offer (according to Ken R.'s tweet). Pujols may enjoy being Miami--who wouldn't. Career-wise this is a stupid move. Post after post have been made seeming stymied at the thought of where Pujols will be going next season. But in actual fact it's really very simple. Taking a page from Dan at C70 and Bernie Miklasz, let's be explicit. There are several factors to consider. First, the obvious, money, position availability, winnability and legacy, and misc (e.g., location, teammates, history). There's 30 teams in baseball--so let's eliminate them by groups to start. -POSITION AVAILABILITY: Let's start with those who already have a big name 1B locked up on the roster even if they could afford him. -MONEY: Those who simply can't afford him. 21. Braves (They could do it, but it would cripple the budget minded team). BAM! Over 2/3rds of the teams are down. -Winnability and Legacy: Pujols has said that he wants to play for a contender. Now, if we are even remotely optimistic that this means money isn't absolutely everything to Pujols, then we can eliminate teams that signing Pujols would probably weaken the overall team because of lack of depth at other positions. Furthermore, Pujols has the opportunity to build upon his legacy. If we assume he isn't completely aware of his potential he would want to put himself in a position to be as great as possible. This would eliminate several teams. 22. Royals (It's hilarious they aren't in the last category. But as Bernie pointed out they technically have the money to pull this off--Pujols would be close to home and as others have pointed out they have the farm to support. But it would still be a super long-shot and Pujols probably won't be tempted by that from a legacy stand-point. 24. Indians (many people have dismissed them because of their super-low payroll. But look at the past few years--it has declined to an ultra-low rate--almost as if they've been preparing for a super-move like this. However, Pujols won't position himself in a place where he will go the way of Jayson Werth--mired as the one big name on a team with no chance). 25. Marlins (Pujols won't want to go to a place with a competitive method like the Marlins--it's legacy suicide. Don't believe me, what are the Marlins called? And after 9PM EST tonight? Yeah, see?). 26. Cubs (This would embitter him to so many it simply doesn't make sense. Sure, it's possible but with how things are simply not stable there at the moment I don't see it happening. Theo could want to make a big hit, but Pujols is particular about managers and whoever they get may not be workable for him. Furthermore, if he believes they aren't winners he might side-step that whole thing. Another thing, he's seen how they've treated the likes of Soriano and other big pay players who don't turn out well). 27. Mariners (if the offer was off the charts it might be too hard to pass up--but it would have to be significantly more than other suitors' bids. The Mariners have more pieces than other teams, but location-wise it is not preferable, it's a pitcher's park, and the Mariner's are pretty much division cellar-dwellers). -Contenders--These are the only teams that have any real chance. -Angels--Winners, have $, have a great manager, but are West Coast. -Cards--Legacy, winnability (less likely the bigger his contract is), beloved by fans, his home is there, manager will probably be someone he knows and who knows him. I fully expect Pujols to be a Cardinal for the remainder of his career and I expect it to be to the tune of $225M for 10 years. P.S. Lesson for the day: don't do a post in the middle of the night halfway, save it, and then try to finish it up the next. Thanks to Ryan at http://analysisaroundthehorn.blogspot.com/ for picking up the slack and catching my many errors.